Elephants are amongst the few wild animals to form strong social bonds of companionship, friendship and family. They are capable of recognising not only their own mothers, calves and siblings but also their grandmothers, aunts, cousins and nieces – and sometimes even fathers. They know elephants they’ve mated and interacted with in the past, and have been observed to form particular friendships with unrelated elephants. These traits arise at least in part from the way that elephants live. ‘Herds’ are, at their cores, very small units – a group of three or four closely related female elephants plus their calves, who live and travel together for all their lives. Sometimes, though, these herds join up with other herds, meaning that occasionally people have stumbled across groups of a hundred or more cows and calves living, feeding, playing and travelling together. These groups almost always split back up into their constituent family units in the end, but should they come across each other again they will express recognition and affection. Male elephants usually live alone, meeting up with herds when it is time to mate and then wandering off again shortly afterwards. They do sometimes form ‘bachelor herds’, however, and it’s common for a group of male calves to all leave their herd and mothers simultaneously and live together for a while before dispersing once they’re fully grown. It’s rare for a bull to travel with a matriarchal herd and it never lasts long, but it does occur occasionally. It is suspected that elephants can recognise and show fondness toward their past mates, although it is uncommon for a father and his cubs to be able to recognise each other unless the father displayed atypical herding behavior after mating. Because they live in such a complex society with ever-changing groups, short-distance and long-distance methods of communication are necessary both to maintain inter- and intra-group relationships and to attract mates when it is time to breed. Experts believe that elephants make use of a wide variety of methods of communication, allowing them to express their emotional mood and psychological state, portray their attitude and intent toward other nearby elephants, and generally engage in all the behaviors necessary to facilitate group living. Long-distance communication is facilitated mostly by the infrasonic emitter present in every elephant’s forehead, just at the join of trunk to skull. These signals can transmit for many miles, and are used primarily by female elephants to signal to males that they are ready to mate. It’s possible too that elephants communicate over long distances seismically, by thundering the ground with their feet. Herds may use these methods to determine meeting places and find each other over large stretches of landscape. Verbal communication between elephants is surprisingly common, compared to many other mammals. They make a wide variety of gurgling noises in the backs of their throats, and of course can also produce a loud ‘trumpeting’ sound via their trunks. These are usually warnings, either that danger is approaching or that the trumpeting elephant is getting ready to charge its perceived assailant. It is not true, however, that a charging elephant trumpets as he moves – when this happens they generally have their trunks wound up tightly, preventing noise from being made. 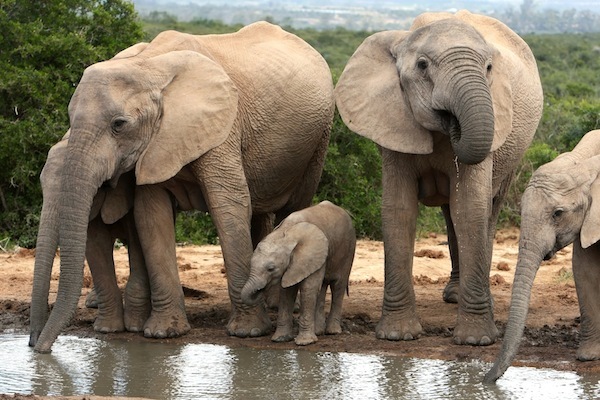 Softer noises are used soothingly or affectionately between elephants, most often from a mother to her calves when they are exhibiting signs of distress. Like all mammals, elephants communicate a great deal through body language. Affection is often expressed by intertwining or ‘hugging’ trunks, usually between close relatives and friends who have travelled in the same herd for a long time. A female elephant will signal her acceptance of a potential mate by rubbing her body full against his, and much tactile communication takes place with the prehensile ends of an elephant’s trunk – they use these to comfort and reassure each other, to greet friends, and to acknowledge the feat of a labouring mother or the presence of new calves. Perhaps sadly, it seems that the much fabled secret ‘elephant graveyards’ are a myth. That doesn’t mean that they don’t recognise the passing of their fellows, however – they are nearly unique among non-human animals in so doing, but they do appear to have certain mourning practices and death rituals. 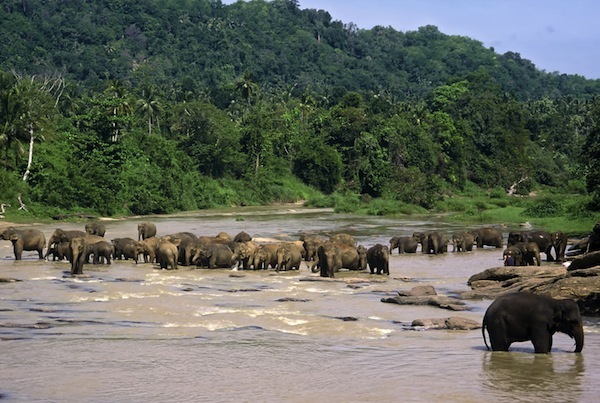 If a travelling herd comes upon a dead elephant while making their journey, they will all gather around him or her – even if she was clearly a complete stranger to them – and take a few moments of silence before moving on, generally touching the body with their trunks as though they are making a show of reverence.